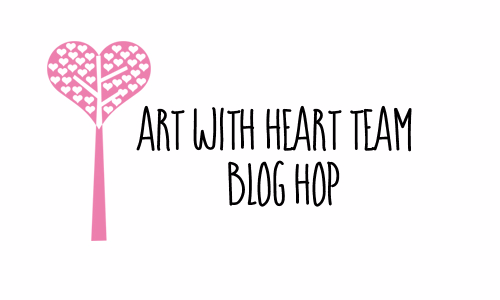 Tonight some of the Art with Heart Stampin'Up! team girls are sharing some fun and fabulous ideas to inspire you from our brand new Holiday Catalogue available on 1st September until 2nd January 2018. You have come from the lovely Judy May Hops are full circles, so you can start hopping here and then at the end of each post is a link to the next one. There is also a list of participants at the end in case of any broken lines. Now let's get started! 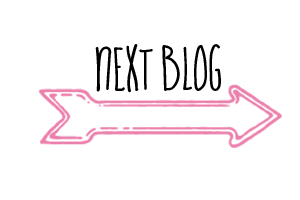 sit back grab a cuppa and enjoy some gorgeous new holiday ideas. I have 2 items today for you the first one is a Christmas desk organiser (Measurements for this are from Crafty caroline in the uk where she does a video tutorial) I am always looking for paper and pen and this is perfect for me and for gift ideas. I used Year of Cheer Specialty DSP and added a small calendar on the top, the little pad is made from copy paper cut at 2 1/4" x 2 1/2" and added a little DSP on the top and glued a red cut out bow with a small Gold Faceted Gem. 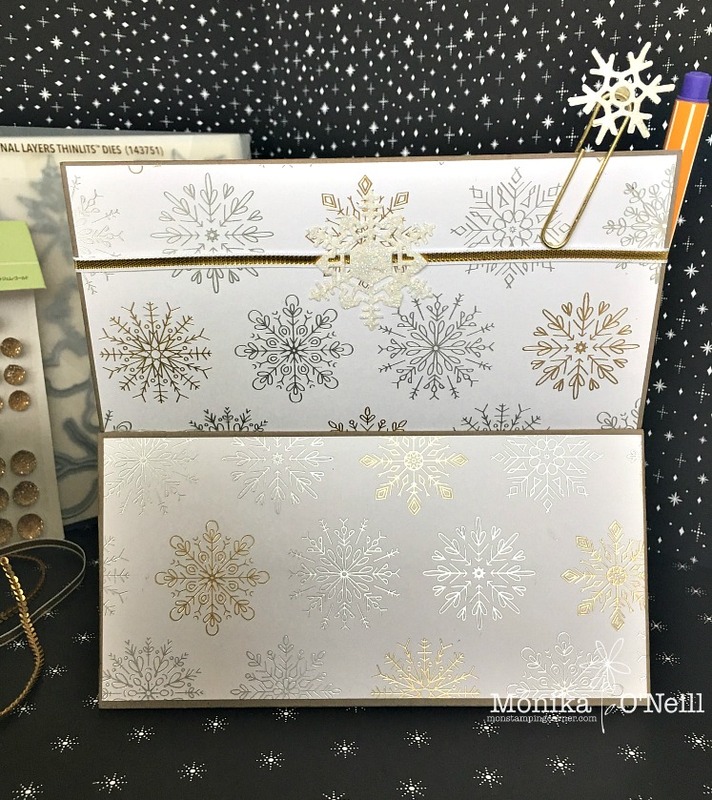 The paperclip on the top is a large gold one from office works and attached 2 snowflakes together cut from Dazzling Diamonds Glimmer paper and a small Gold Faceted Gem, handy to attach any small notes to. Under the calender I added some 1/8th gold ribbon. On the front of the box I added the same gold ribbon, mini gold sequins another snow flake and a Gold Faceted Gem. Below is picture of the little note book I made from copy paper. 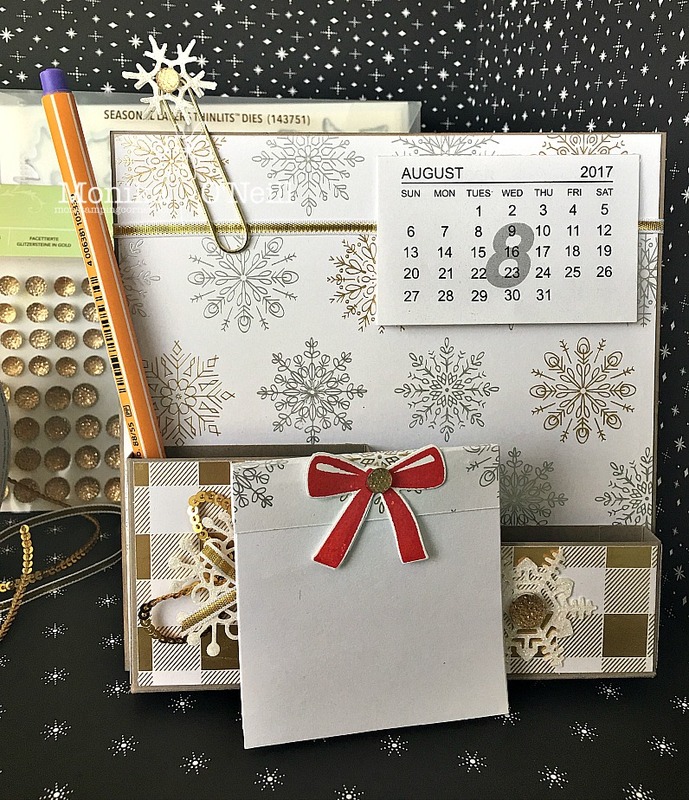 Below is a side view of the calendar. And last picture of the back, I decided to add DSP on all sides to add some extra strength. 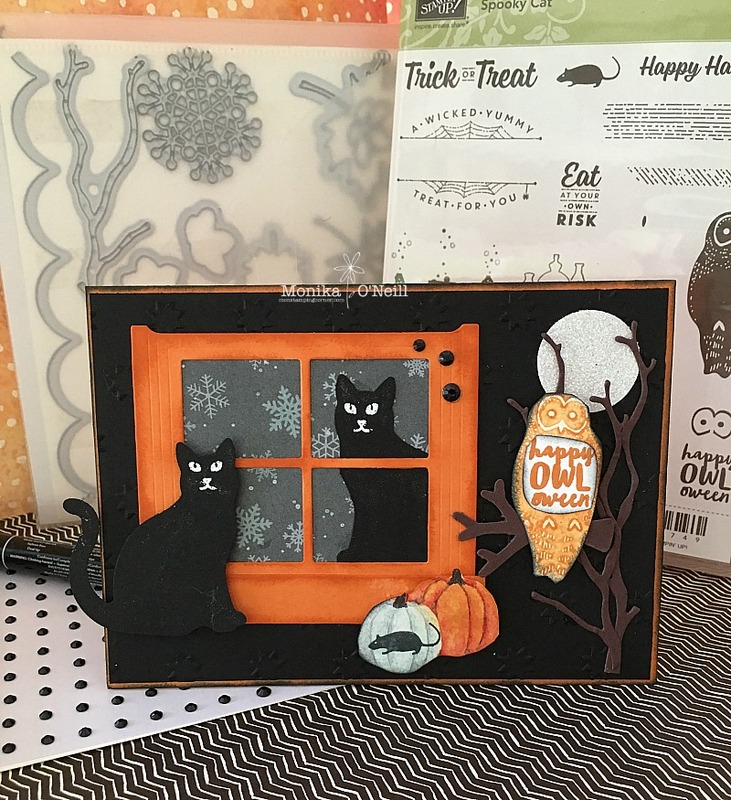 For my second project I made a Halloween card using the Spooky Cat Bundle, I love this set as I own 4 cats (wait a minute they own me lol) as soon as I saw this bundle it was the first thing on my list to get.. I actually don't mind Halloween and decorate my house, where I live we get the local kids trick or treating, I put on my witches hat and have my big pumpkin bucket full of sweets for all that come knocking at my door, it's all a bit of harmless fun. So now onto the card, I used Pumpkin Pie for the base and Black Card stock for my mat and used the Oh My Stars textured Embossing Folder, the window I cut out of Pumpkin Pie Card stock using the Hearth & Home Thinlet and sponged the edges in Pumpkin Pie. I finished the card of with Wink of Clear Stella and Black gems around the window. And a picture of the inside of the card. Oh wow, your organiser is fabulous! What a great project! I like love the desk organiser Monika, what a great idea! Great, and very different, projects, Mon. I am a sucker fo the Year of Cheer DSP, so I really love what you've made to keep pens and paper organised! Mon, yyour desk organiser is wonderful, but I want to say thanks for sharing some Halloween with us!!! Being in Australia, it is not so popular, but you have created a great, spooky card. Thanks for sharing! What great projects Mon, the organiser is great!, that paper is fantastic! How fun is that spooky card, reminds me of all the trick-o-treating when we lived in New York. 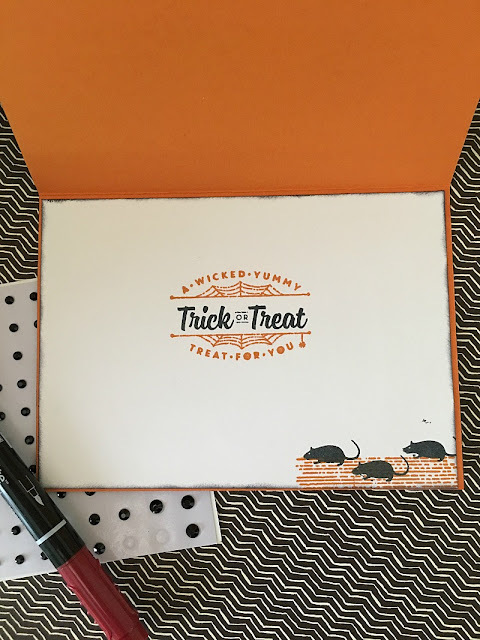 I am not a hugeHalloween fan but your card is so cute. And I just love the desk organiser...you've inspired me to make one myself! Fabulous projects, Monika. 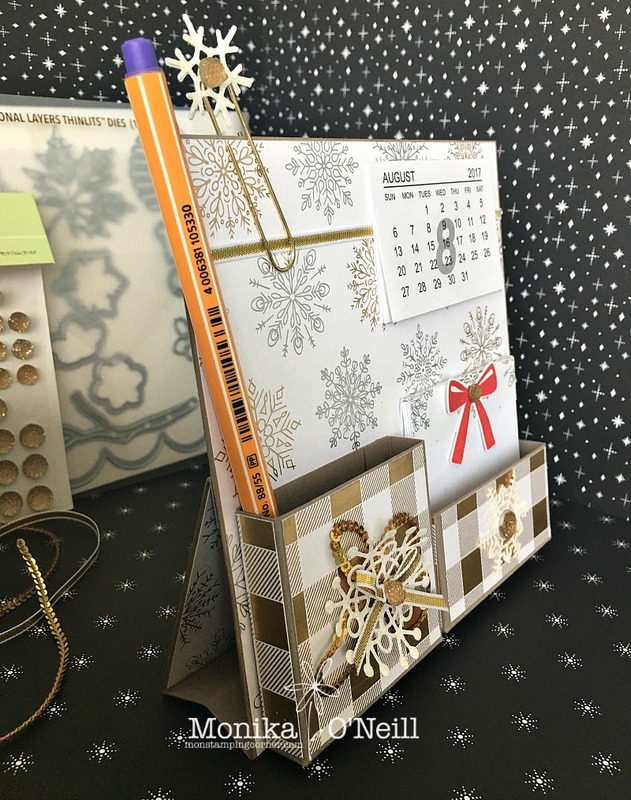 Love the desk organiser, such a great gift idea. Although I'm not a Halloween person, I am a cat person and love the cats on either side of the window in your card. It is such a classic cat pose. The inside looks great, too. Fabulous projects Monika. Love that cat punch too (what cat lover doesn't?). Your desk organiser is AMAZING though! All the bits and pieces you have included is great! Well done and thanks for participating in the Art with Heart August blog hop!